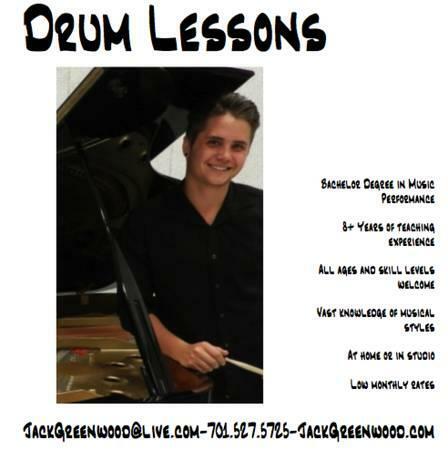 I teach Private Drum Lessons in a convenient location in central Bismarck and I currently have a few openings for new students. I have a Bachelor's Degree in Music Performance from McNally Smith College of Music in Saint Paul, Minnesota. I have spent the last five years living in Minneapolis/St. Paul performing professionally and studying with extraordinary musicians with very diverse backgrounds. Working with many different bands that played Rock, Funk, Jazz, Country, Raggee, and/or Latin, has giving me a wide knowledge of musical styles. Now offering private video lessons via Skype. All the benefits of private lessons in the comfort of your own home while still supporting your local musicians. Feel free to contact me to get started or if you have any questions.